I've always been drawn to the color robin's egg blue & likely always will. I usually pair it with coral or yellow, but for some reason, lately I've been looooooving it with orange! It makes the robins egg blue look more aqua and honestly, it makes me anxious for spring like crazy. It all started when Chase gave me those tulips I mentioned here. I put them in an aqua mason jar as a vase and it all went uphill quickly. 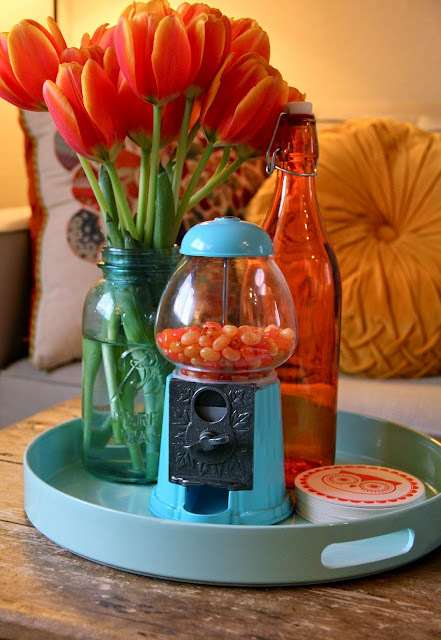 I also scored a cute vintage looking gumball machine and put some orange jelly belly's in it ((yum!)). When I found the round tray, I knew it would be perfect for a little grouping of pretty orange & aqua things on our coffee table. What's your favorite color combination these days? I LOVE that look! Totally makes me want spring time! My favorite color combo lately would have to be dark grey and coral. I love orange and aqua, it's probably my current favourite, although I really like grey and yellow too! Love that! I've been loving really bright colors paired with navy lately--navy and yellow, navy and bright green. Oh my. I LOVE those two colors together!!!! I love this look Kim!! You could easily be an interior decorator!! i've recently been seeing these color combinations together a lot lately. love it!!! I am so BAD with coordinating colors...this is such a BEAUTIFUL mix! I am inspired to try and create with these two!! Love the color combo! Your lovely, colorful instagrams always brighten my day! love these photos! that is a really great color combo. I really like that tray and that yellow pillow... I'd love to find one like that, it's such a pretty design. 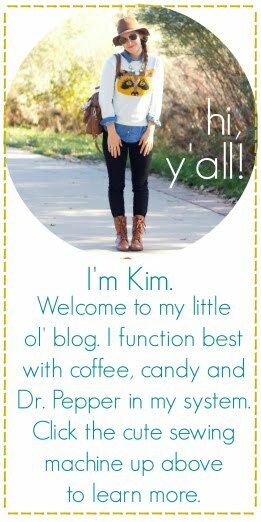 been following you now.... got you blog from maiedae im her follower. anything with yellow these days (craving spring too, it seems! )...although your tulips have me jumping on the robins' egg and orange bandwagon! such a good combo.